Blaze International (ASX: BLZ) has identified nine high priority targets, all with coincident magnetic and gravity anomalies, at the joint-ventured Barkly Copper-Gold Project in the Tennant Creek Mineral Field in the Northern Territory. Under the terms of a joint venture with Meteoric Resources (ASX:MEI), BLZ has already earned a 50% interest in the Project and has the right to earn up to 80%. 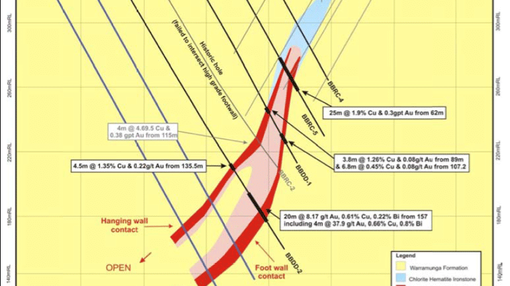 The Bluebird copper-gold Prospect is BLZ’s priority prospect at Barkly, and comprises a 1.6km long gravity ridge open to the east, where shallow geochemical drilling by Meteoric Resources identified a 600m long copper anomaly, also open to the east. The Bluebird Prospect is geologically comparable with large historic deposits nearby such as Nobles Nob and Peko. Numerous untested remnant magnetic anomalies similar to Bluebird were identified in re-processed ground magnetic data, along with coincident ground gravity anomalies. Targets will be further refined and rationalised by geological mapping and surface geochemistry before drill testing. The Tennant Creek Mineral Field has generated over 5.5 million ounces of gold at 19.3 g/t and 448,000 tonnes of copper at 2.9%. Notable historic deposits, both located within 20km of BLZ’s Barkly Project, are the Peko mine and Nobles Nob mine. Peko produced 414,000 ounces of gold at 3.5g/t gold with 147,000 tonnes of copper at 4%; while Nobles Nob produced 1.1 million ounces at 17g/t gold. Recent activity in the Tenant Creek Mineral Field includes a commitment by $470M market cap Evolution Mining (ASX:EVN) to spend around $28 million on exploration in the region in joint venture with $14M market cap Emmerson Resources (ASX:ERM). The two most important geophysical techniques for targeting Tennant Creek style copper-gold mineralisation are magnetics and gravity surveys. A number of companies have collected data within the Barkly Project area over several decades, and BLZ has now acquired all of this information. Some closed file aeromagnetic data are still being acquired. The magnetite rich ironstones hosting the mineralisation strongly contrast with the relatively weakly magnetic Warramunga Formation country rock sediments. The ironstones and associated sulphide mineralisation are also denser than the country rock and may therefore be amenable to detection by gravity surveying. Gravity is particularly important in targeting non-magnetic hematite hosted deposits such as Peko and Nobles Nob. The reprocessed, gridded and imaged geophysical datasets have allowed BLZ geologists to fingerprint the signature of the Bluebird mineralisation and find other similar features within the Barkly area. The targets will be ranked based on coincident magnetic, gravity and geochemical anomalies similar to Bluebird or other nearby deposits. Of particular interest is a large magnetic body, coined “General Electric”, with a deep root system. 3D inversion modelling of the ground magnetics has refined the anomaly. General Electric hosts several remnant magnetic anomalies and coincident gravity anomalies which will be the initial focus of follow-up activity. The company is now fully funded for comprehensive copper-gold drilling at the Barkly project. BLZ entered into a convertible note trust deed to raise up to $1.25 million from sophisticated and professional investor clients of CPS Capital group. The notes to be issued have a face value of $0.0008, a flat interest rate of 10%, a maturity of 6 months from date of issue and are convertible into BLZ shares on a one for one basis. This planned drilling program is designed to follow-up on standout holes from the previous program at Bluebird: 20 metres at 8.17g/t gold, 0.61% copper and 0.22% bismuth from 157 metres, which including 4 metres at 37.9g/t gold. The aim of the drilling program is to enable the estimation of an initial JORC 2012 mineral resource estimate for Bluebird and assess the economics of a potential mining project.